Suzanne Anker is the Chair of the Fine Arts Department at the School of Visual Arts in New York City. Suzanne is also a well known visual artist and theorist working in a variety of mediums ranging from digital sculpture and installation to large-scale photography to plants grown by LED lights. Her work has been shown both nationally and internationally in museums and galleries including the Smithsonian Institute, Medizinhistorisches Museum der Charite in Berlin, Pera Museum in Istanbul and many others. 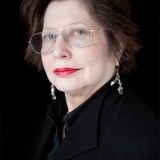 Her books include The Extant Vamp (or the) Ire of It All, Visual Culture and Evolution, and she has been featured in Art and America, Seed Magazine, Nature Reviews Genetics, Art Journal, The New York Times, Art forum and Art in America. She has been a speaker at Harvard, Yale and the Royal Society in London, Cambridge University.